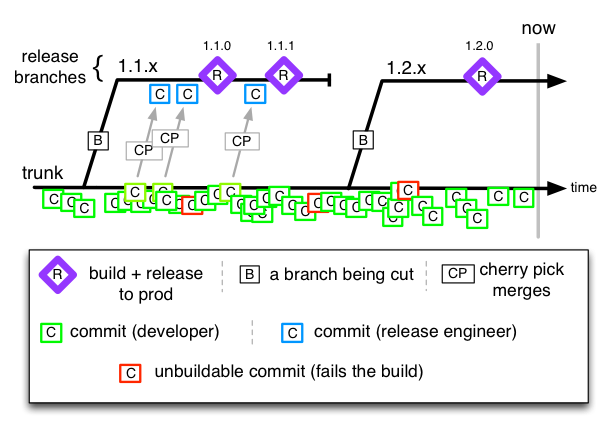 We have to support multiple releases, so we are following git branching model similar to the above diagram. 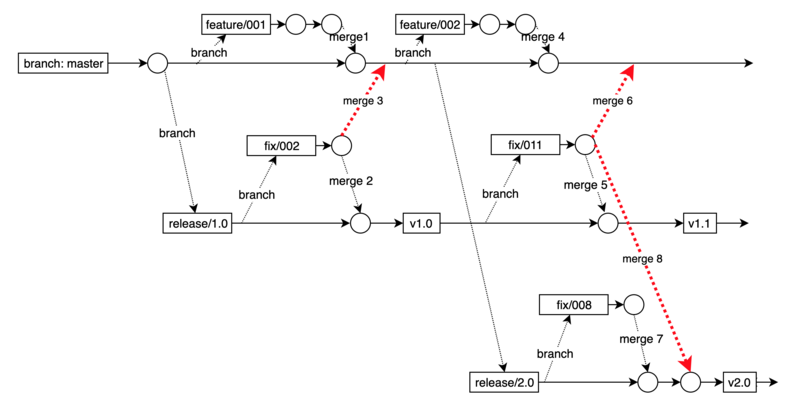 Now the problem is that we have to do lots of merging here example for fix/011, we are merging it three different branches(master, release/1.0 and release/2.0). Also there is question of from where to create this fix/011 branch from master, release/1.0 or release/2.0? Creating it from master brings unwanted features, creating it from any release branch brings merging overheads and conflicts and cherry pick back to master is error-prone. One good option I found is forking fix(/feature) branch from all branches (refer: https://docs.microsoft.com/en-us/azure/devops/repos/git/git-branching-guidance?view=azure-devops#port-changes-back-to-the-master-branch) but our developers didn't find it much different from exiting approach and they feel is complex. The thing to remember is that merging a fix also merges all its ancestors, so if you want to keep code in 2.0 out of 1.0, your merges should always go from 1.0 to 2.0, and never the other way around. That means fixes need to be made (or rebased onto) the oldest branch possible, then merged into the second oldest, then into the third oldest, and so forth. This takes a lot of discipline, as usually developers prefer to work on the bleeding edge, and only think about the maintenance branches as an afterthought. Unfortunately you can't do this with branching. In fact you should not be doing those red line merges at all. As soon as you decide that the release X is not going to be getting updates from master you can't merge your fixes back from that branch. You have to write the fix for each branch separately. If you don't want to merge release branches in other release branches (because for example you create tags on the release branch and want to know what the latest tag is on the branch you're working on) you can create fix branches along side the release branches and merge the fix (for example fix/1) branches into their own release branch (release/1) and into their next fix branch (fix/2). Instead of creating bugfix branches from the release branch you then create them from the fix branch. Note: I mean major/multi-changeset merges here, not individual changeset (cherry-pick) merges. you can also have child release branches for minor releases off the major ones, as well as hot-fix twigs, if you really need/want to - as many as you can afford (the higher their number the thinner you'd be spreading your resources, it can get costly). But it does require a mental shift for development branch users. Personally I believe TBD is the only solution that can scale for large projects, for which branch merges typically translate into Integration/Merge Hell. Having a good CI/CD pipeline in place at least on the master branch is pretty much mandatory, especially for larger projects. Release branches can benefit from having one each just as well! I do not think that there is a good branching/merging/commit control strategy that fits well here. merge the change forward from the oldest common ancestor, but this produces truly weird commit histories, and requires some measure of discipline. Cherry pick commits, losing the context of their development, and producing a truly large headache should version 1 or 2 ever need to be merged back into master. not support patching/improving the older releases, though this has obvious business implications. When the problem becomes painful usually the best strategy is to divide it into smaller more manageable problems. split the project into 2 different products, give them separate repos and fix the bugs twice. refactor the codebase pulling out common code into libraries which can be patched independently. split the UI's off, and homogenise the back-end - offering two skins. Why do you need to maintain separate versions? The answer to that will be interesting. If its about money, consider giving them a discount to upgrade and allow simplifications to occur. If its about the UI and user training. See if you cannot offer the old ui over the newer engine. If its about the back-end database or some such. Try and address the issue. Is it to risky to migrate? Do you no longer support their DB engine? These could be addressed, removing the need for a second version. Is it that version 1 provides a different set of features in contrast to version 2? Perhaps splitting it into two products backed by some common libraries? Is it because you are selling support? (no joke) Hike the support fee to offset your pain points. Or if you are less barbaric hike the fee for new features/bug fixes that aren't affecting security and primary product features - and live with the pain. Not the answer you're looking for? Browse other questions tagged git version-control github branching release-management or ask your own question. Is a merging strategy like Git Flow really an anti-pattern?